M4 surgical suite LED luminaire is sealed for infection control. Lens uniformity reduces glare, and symmetrical or symmetrical/asymmetric lensing options allow for customization of light delivery. 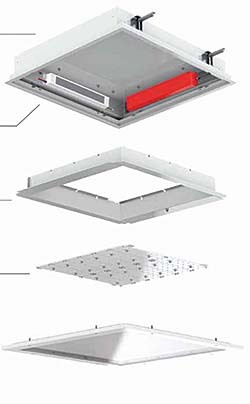 Housing is a seam-welded single piece with an antimicrobial finish on all painted surfaces that are exposed after installation. LED drivers operate at a minimum of 85 percent efficiency with 0-10V dimming with 10 to 100 percent range. Optional battery pack supports continued operation during power loss.